Karnataka with its capital at Bangalore is the country's 8th largest state. It is located at Deccan Plateau, and is surrounded by Maharashtra to the north, Arabian Sea to the west, Goa to the northwest, Kerala to the southwest, Andhra Pradesh to the east and Tamil Nadu to southeast. Karnataka's economy benefits from gold, manganese, oilseed, coffee, silk and sandalwood production. Over 90% of India's gold production comes from south Karnataka. Extractions are carried out at manganese ore from the districts of Bellary and Hospet. Karnataka is the largest producer of coffee, raw silk and sandalwood based products. Its service sector boasts of its Real estate, Consultancies, Travel and Tourism, Educational Institutes, Hotel Industry and Insurance. Once the capital of the early Chalukyan dynasty (6th to 8th centuries), Aihole is a picturesque village on the banks of the Malaprabha river. 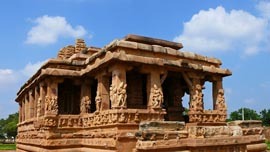 Variously called Ayyavole & Aryapura in the inscriptions, Aihole is historically famous as the cradle of Hindu temple architecture. There are about 125 temples divided into 22 groups scattered all over the villages and nearby fields. Most of these temples were built between the 6th & 8th centuries and some even earlier. Temple at Aihole Only mere traces of a fort dating from the 6th century can be seen today. A large number of prehistoric sites have been found in Morera Angadigalu, near the Meguti hillocks in Aihole. Excavations near some temples have yielded traces of antique pottery and bases of structures constructed with bricks of pre-Chalukyan times. 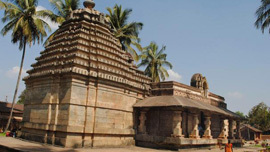 More temples are being excavated every day bearing witness to the vigorous experimentation on temple architecture which went on at Aihole more than 14 centuries ago. Mangalesha (598 - 610 AD) brother of KiritavarmanI completed the construction of the cave temples & endowed the temples with the village on the occasion of the installation of the image of Vishnu. The greatest ruler of the dynasty was Pulakeshi II (610-642 AD) who among others defeated the Pallava King Mahendra VermanI. The Pallava later captured & destroyed Badami to avenge their defeat Badami was also in the possession of the Vijayanagar Kings, The Adil Shahis, The Savanur Nawabs, The Marathas, Hyder Ali & finally the British who made it part of the Bombay Presidency. Bangalore is Asia's Silicon Valley because of its thriving information technology industry. Bangalore is India's fifth - largest and fastest - growing city. Until its high-tech boom began in the late 1980s, it was known as the Garden City, with greenery flourishing in its pleasant, temperate climate. 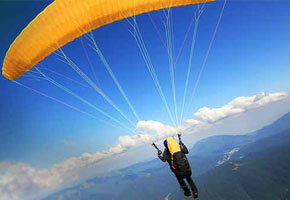 Today with a growing population of young professionals, it has acquired a vibrant, cosmopolitan air. Bangalore was founded in the 16th century by a local chieftain, Kempe Gowda, but derives its name from the Kannada word benda kaluru, or "boiled beans", which an old woman gave a 10th century Hoysala King when he turned up hungry at her doorstep. 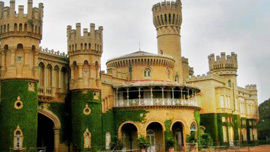 This bustling city of Karnataka was an important garrison town under the British. Nestling on the foothills of the Western Ghats, this British cantonment has a picture of contrasts with historical forts, temples and natural beauty all around. During British era, Belgaum had significant military presence. It was also a provincial centre under the Adil Shahi rulers of Bijapur, the Marathas of Pune and as well as the Mughals. Today, Belgaum is a full fledged district and a municipal corporation bordering Goa and Maharashtra. To the east of the city is the Belgaum Fort, a blend of Hindu-Muslim architecture. Inside the fort you can see temples and mosques co-exist in perfect harmony. The fort was built in the 12th century A.D by the local Ratta rulers. It was renovated and built on by successive rulers. At the entrance gate, you will find two Shrines - one dedicated to Lord Ganesha and the other to Goddess Durga. The city of Bidar rose to prominence when it became the Bahmani capital during the reign of Ahmad Shah Bahman (1423-1436 A.D) in 1429. Ahmed Shah was awestruck by the scenic beauty and climate of the place and he decided to build a new city near its ancient fortress and called it Ahmadabad-Bidar. 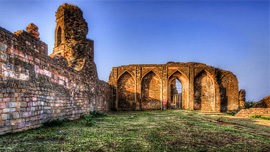 Ahmad Shah also laid the foundations of the Bidar fort. 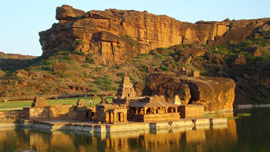 Once the majestic capital of the powerful Vijayanagara Empire, Hampi is now a ruined city of ancient palaces and forts. Founded by Harihara and Bukka in 1336, the landscape of Hampi was dotted with magnificent palaces, sacred temples, massive fortifications, baths, markets, pavilions, and stables for royal elephants. 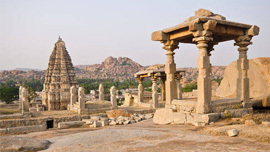 The Vijayanagara kings were great patrons of art and Hampi became the epicenter of a flourishing indigenous culture. 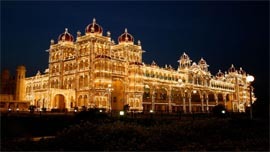 Mysore is a beautiful city full of elegant public buildings erected under the Wodeyar rulers. The most delightful is the Amba Vilas Palace situated on the heart of the city. To its west is the Jagmohan Palace, constructed to mark the coronation ceremony of Krishnaraja III. Near the northwestern corner of the Amba Vilas Palace is Krishnaraja circle where a statue of Krishnaraja Wodeyar stands beneath a pavilion. The Shaayaji Rao Road that leads out from this circle is the principal shopping centre of the town.